Mix the bran cereal and milk in a large bowl and let stand until softened. 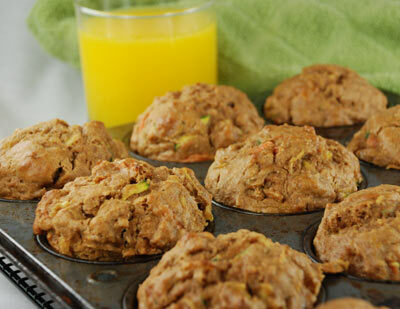 Fold in the peanut butter, apple, zucchini, carrots, brown sugar and extract until mixed together. In a small bowl, beat the egg and egg whites; fold into the bran mixture. In a medium bowl, combine flour, baking powder, orange peel, cinnamon and salt. Add the dry ingredients to the bran mixture, taking care to not overmix. Spray the cups of a muffin pan with cooking spray. Divide the batter evenly among the muffin cups. Place a shallow pan of water on the bottom oven rack. Bake for 20 to 25 minutes until golden brown. Remove from muffin pan and serve. Recipe used with permission and provided by the Peanut Advisory Board.